Innovation can be tough to define, but it is easy to spot. 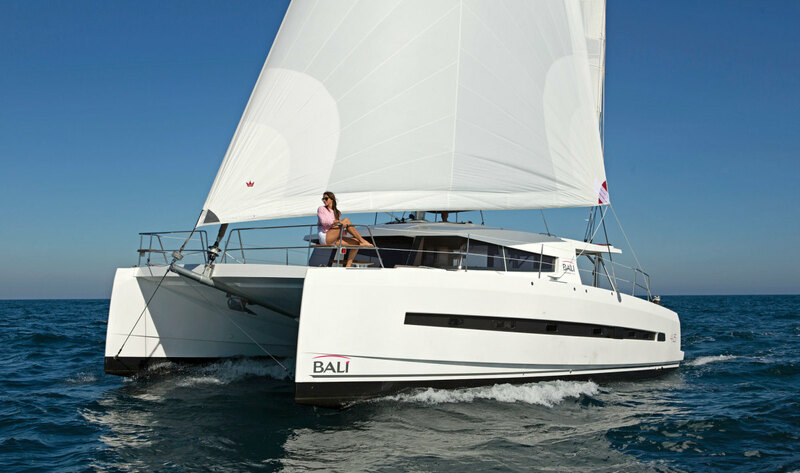 One look at the new Bali 4.5 catamaran and it’s clear that its designers have reached beyond tradition and rethought the flow and uses of the vast social spaces aboard a mulithull. The resulting concept, which Bali calls “Open Space,” has created an all-new boat that will undoubtedly give the competition a run for their money.  Behind the Bali line is the established catamaran builder Catana, known for seaworthy boats with a good turn of speed and a bulletproof build. Wanting to address new segments of the market at a reasonable price point, Catana has launched this new brand, which is sure to enhance the economies of scale in their French factory and also leverage their administrative overhead costs. Sixty to 80 Bali cats are expected to be turned out per year once the brand gets a foothold. 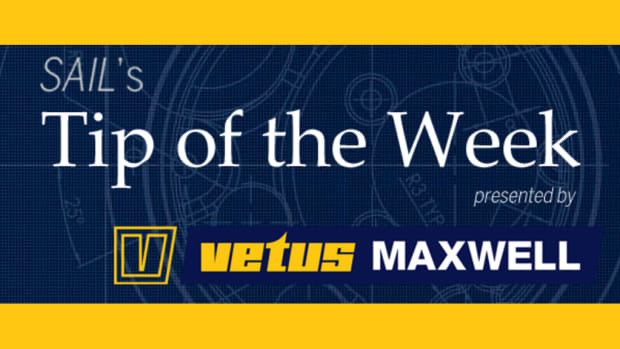 From the desk of naval architect Xavier Fay, the foam-cored, vacuum-infused hulls have a chine about 2ft off the water, which should deflect spray, provide a bit more interior volume and increase the hulls’ buoyancy. The nacelle is high and angled in such a way that it should not slam, even when going to weather, and unlike Catanas, which have daggerboards, the Bali has fixed keels attached to watertight recesses at the bottom of the hulls, which also serve as gray-water holding tanks. The sheet for the self-tacking solent on a Facnor furler runs to a track just ahead of the Sparcraft mast on the cabintop, which keeps it out of the way of anyone on the foredeck. 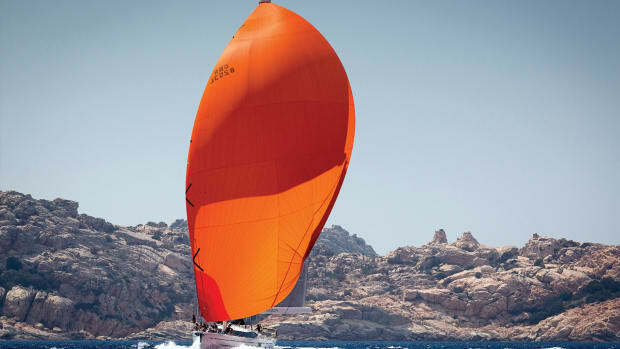 However, it can make the headsail curve back in on itself where the sheeting angle creates a bit of a wind brake. A bowsprit serves as the attachment point for a Code 0. Sails are by Elvström. Even from the dock, it’s readily apparent there’s something different about the Bali. This new design does away with the forward trampoline, replacing it with what can only be called a patio. 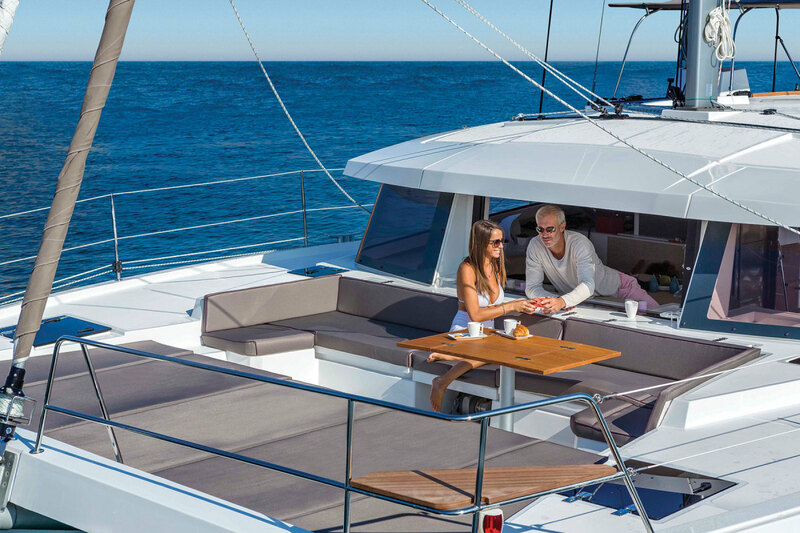 Traditionally, cats have kept the forward deck light by incorporating little more than bracing beams and netting, but Bali has gone all out on the opposite tack by adding solid surfaces covered with cushions. Yes, this adds weight. However, on the plus side, a transverse beam is no longer necessary as the boat is stiffened by the deck. Two tables and forward-facing seating for eight nestle up against the cabintop and a nearly full-beam lounge will accommodate six sunbathers. A large, vertically opening window allows for air to flow in and out, and for food and drinks to be passed from the galley. A Quick horizontal windlass is located below the seating and lounges, with the anchor up forward and under the pads. It’s not a bad system, although a cleat will need to be added to secure the anchor bridle when underway. 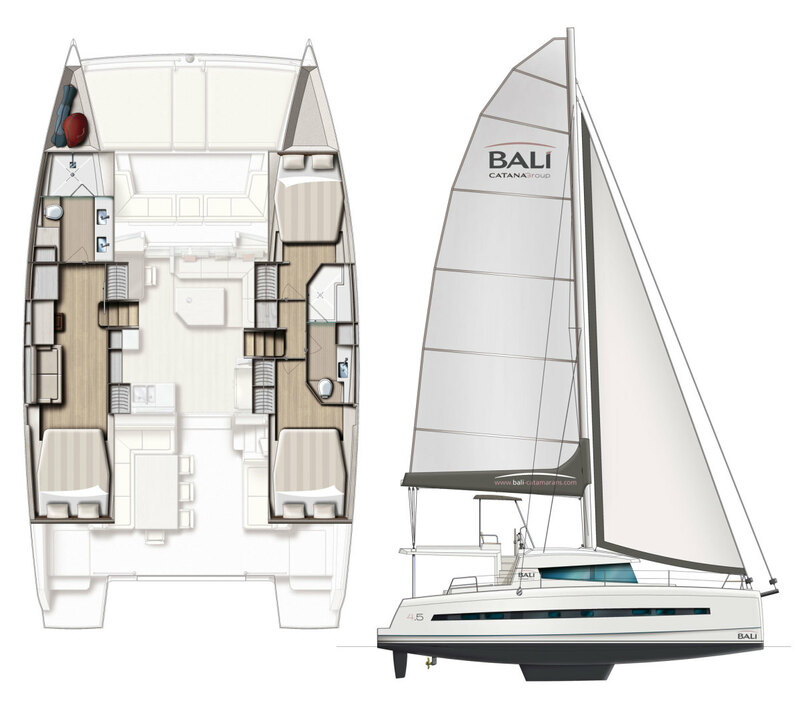 The Bali 4.5 is available with a starboard-side helm station or a flybridge (shown in the sailplan drawing on the facing page). Our test boat was hull #1 of the flybridge version, which has the added benefit of seating for four and good visibility forward. 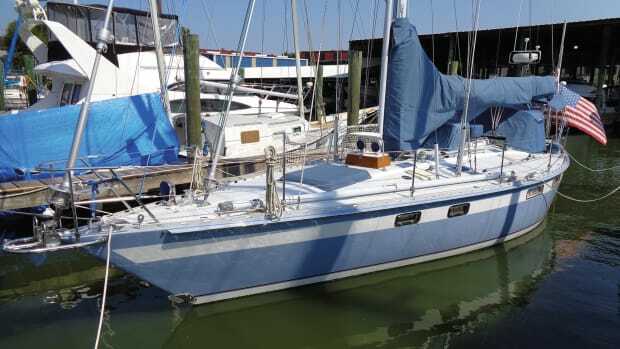 The downside of this configuration is that the boom must be raised to provide room for flybridge occupants, which cuts into the mainsail area and adds weight far above the waterline. Also, access to the side decks is awkward, and the navigation instruments and engine gauges end up being mounted at knee-level. I suspect most people will opt for the side-helm version, which provides better access to the aft cockpit and the side deck. It also has a more useful instrument panel, reasonable visibility forward and ample room for additional cabintop sun pads. The aft cockpit is spacious, with a port-side dinette that will seat eight at a squeeze. There is also a lounge to starboard that some may scope out as their favorite spot aboard. Stainless steel dinghy davits lower down to the waterline, so the tender can be hooked up more easily. Once the dinghy is down, the vertical section of the transom folds down as well to extend the cockpit another 2ft, which will not only keep traffic flowing when at anchor or the dock, but also provide easy access to the dinghy. The hulls on either side are blunt and should ease boarding in Med mooring situations. Engine access is fairly standard from the hull steps. One notable aspect of the engine room is the oversized 225-amp alternator on the port side, which is used to charge the 720Ah house bank. An Aquabase engine-driven 50-gph watermaker is also to port, with the control panel accessible at the nav station. Sufficient power and fresh water should not be a problem on this boat. The Open Space concept continues inside, where a sliding aft door and separate window lead from the cockpit to a space where convenience is king. To starboard is a full-size, side-by-side refrigerator with a built-in ice maker just like at home. This is an AC fridge, which is part of the reason for the large battery bank. Solar panels on the cabintop and an 11kW Onan genset assist with power management. To port is a full galley with an Eno cooktop and separate, eye-level oven. An abundance of countertop space will accommodate two or more sous-chefs. Touch-screen control panels for most of the systems aboard, including the genset and watermaker, can all be found among the other instruments peppering the forward-facing nav station, as is the control unit of the Fusion stereo. In the three cabin/three head version, the owner’s suite occupies the port hull. A wide berth, sofa and desk are home-style touches, and the head, with his-and-hers sinks, is large enough to honestly be called a bathroom. The starboard hull holds two cabins and two heads. 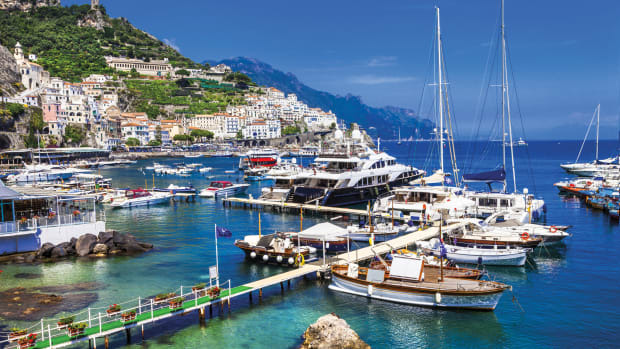 Another option offers three cabins and two heads, with a shared head and shower in the starboard hull and a second head and shower for the owner’s accommodations in the port hull. 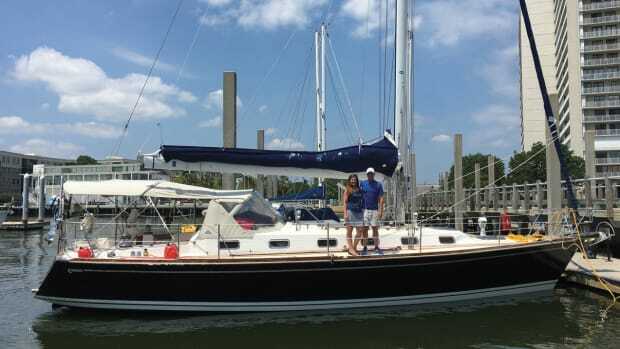 For the charter trade, a four-cabin version with matching hulls is also available. With flat water and 12 to 15 knots on Biscayne Bay, we enjoyed ideal conditions. At a 60-degree apparent wind angle, we scooted along at 7.2 knots. On the beam, we saw speeds around 7.5 knots, and we dipped to 5.1 knots when we fell off to 120 degrees. 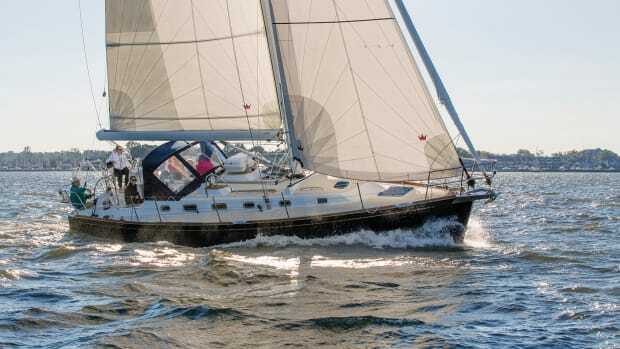 The self-tacking solent couldn’t make it easier when single-handing, and a reacher would be a fantastic addition for extended downwind sailing. Auxiliary power is provided by two 40hp Nanni (Kubota) diesels, although on our test boat these had been upgraded to the optional 50hp models. The saildrive units have been turned 180 degrees to provide more room and set the rudders well aft for better control. On flat water we motored at 6.8 knots at 2,000 rpm. Wide open at 3,200 rpm, we reached 8.6 knots. 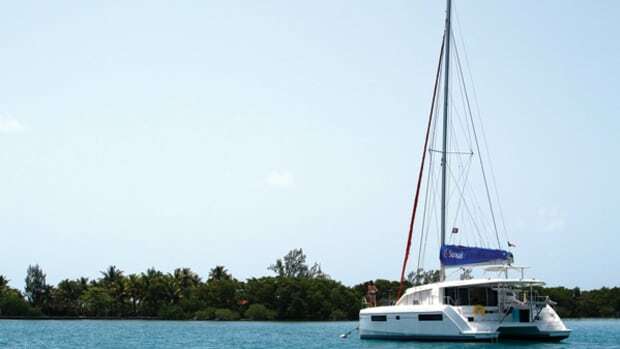 With the Bali line, Catana is satisfying different market sensibilities and it does so in a way that sets it apart from many production multihulls. Kudos to the designer for tossing out traditional expectations and reaching for the elusive but obviously still possible innovation that may just redefine future cruising cats and the way we use them.